Welcome to Day #6 of Appetizer Week, a multi-blogger event co-hosted by Kim of Cravings of a Lunatic and Kristen from Frugal Antics of a Harried Homemaker. Whether you are a Broncos fan or a Seahawks fan , we wanted to make sure you had plenty of ideas for your game day spread. Each day we will be dishing up a different set of appetizers. We hope you enjoy this fabulous group of recipes. Tune in each day starting with Monday, January 20 and ending on Saturday, January 25. Today is our final day of #AppetizerWeek. We hope you have enjoyed it as much as we have! Should we make it an annual event? I think so! 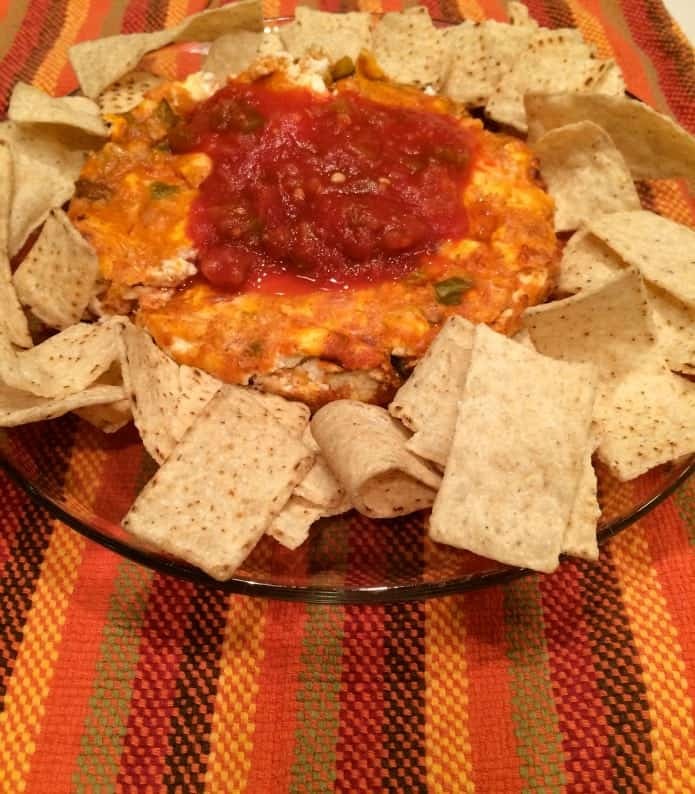 Salsa cheesecake has been around a while. The first time I made one, I was hooked on these. This recipe is for a small cheesecake that will fit in a 5″ round pan. You will want to double it to make a 9 inch cake-sized springboard pan. This smaller version works, with a few simple steps. 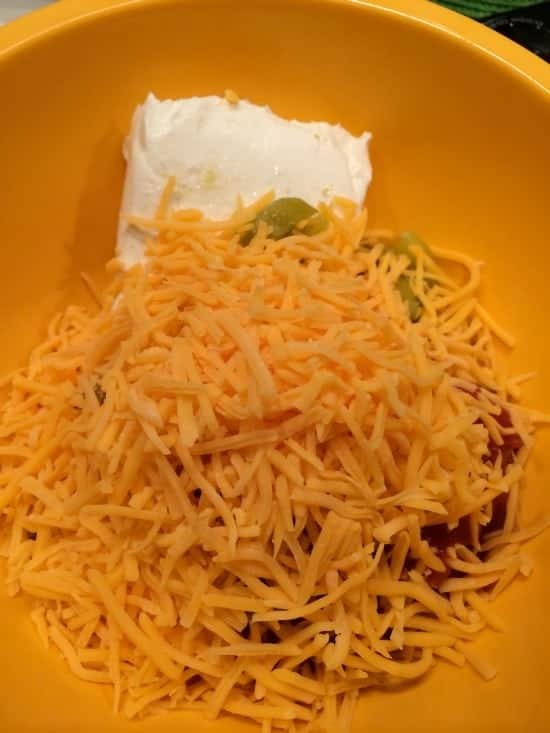 In a bowl, mix together cream cheese, cheddar cheese, 1/4 cup salsa, and green chili, egg and spices. Prepare a small cake pan. line the bottom of the baking pan with a piece of parchment paper cut to size. Butter sides of baking pan. Pour cheese mixture into pan and bake 20-25 minutes. Let cool a few minutes before attempting to remove from pan. 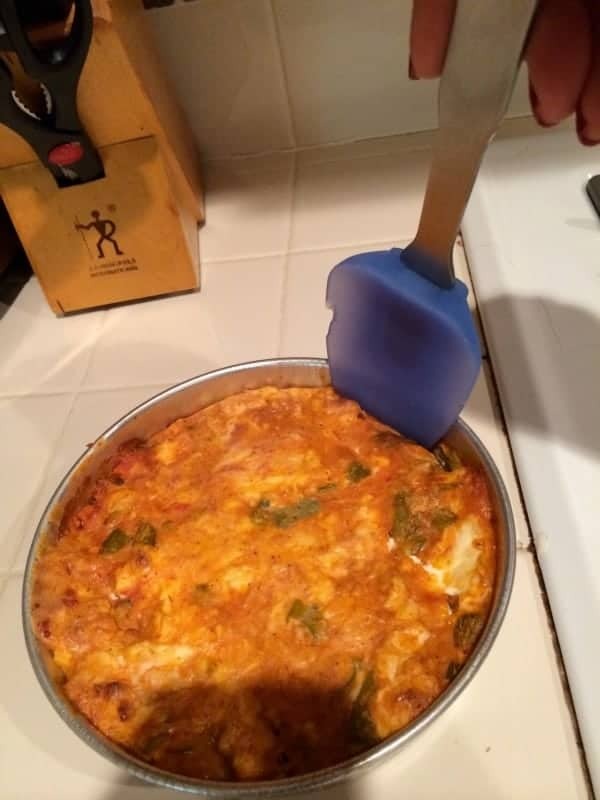 Use a spatula or butter knife to slowly remove from pan. Flip over onto a plate using pot holders. Then flip again using a second plate so cheesecake is right side up. Top with remaining 1/4 cup salsa and serve with tortilla chips. 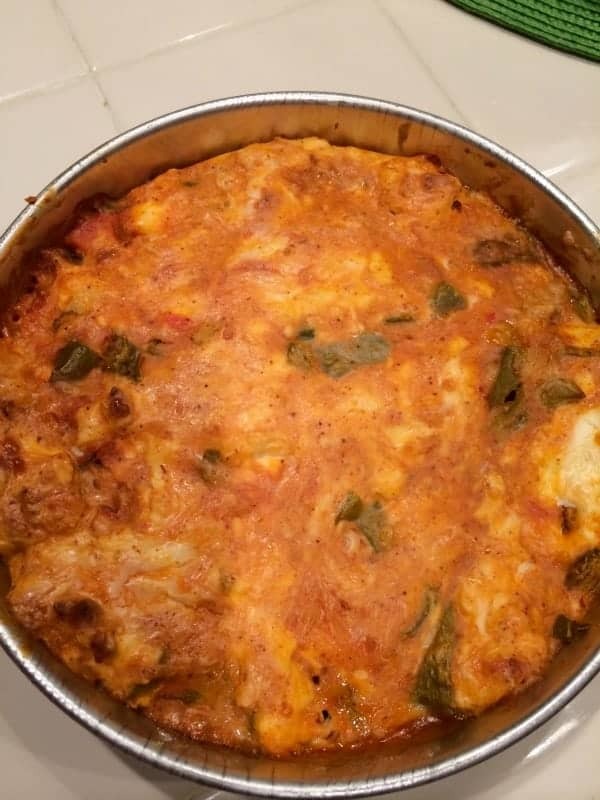 You can even add some sour cream on top if you like. This recipe can be doubled and is easier removed using a 9″ springform baking pan. 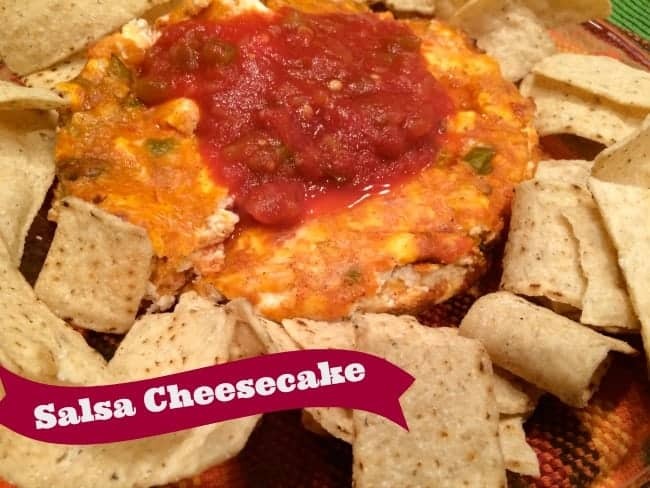 Have you ever tasted Salsa Cheesecake? Today’s giveaway is absolutely amazing. 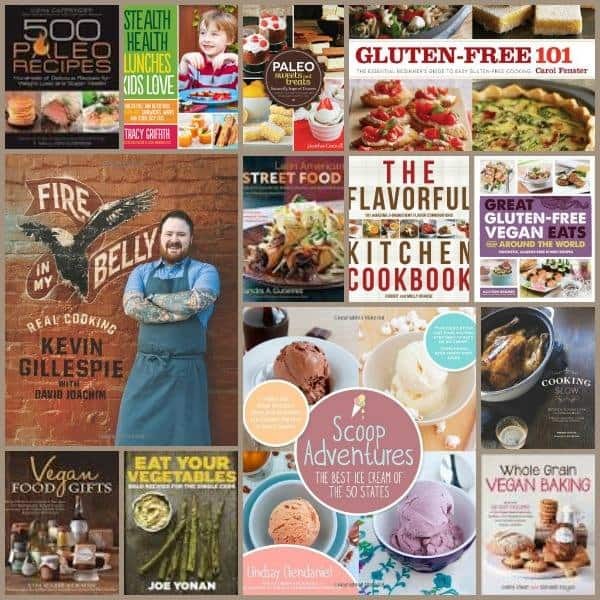 It is a huge cookbook giveaway, one winner takes ALL. 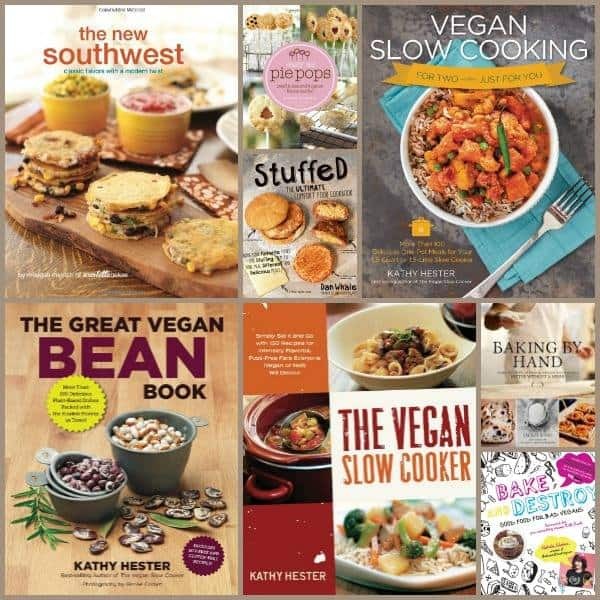 We would like to thank Healthy Slow Cooking, Scarletta Bakes, Quarry Spoon and Fair Winds Press. We appreciate all our sponsors and folks who helped put together this fabulous giveaway. This giveaway is open to U.S. residents only. Sorry to all our Canuck and International friends. My favorite is Baking by Dorie Greenspan. So at what point do the egg, bread crumbs, and spices become part of the recipe? Thanks for letting me know. My sentence was cut off. It is all mixed together before baking, except for 1/4 cup of the salsa. Love my Runner’s World cookbook! Any canning cookbooks- they are so fun! I like the sound of this. It would be a hit at any Super Bowl party. I’d love it if you linked this to our party at Tumbleweed Contessa. The Pioneer Woman’s cookbooks are my favorite. Oh my, that looks so good!!!! And really who wouldn’t be able to use all those cookbooks! My favorite cookbook is The Moosewood Restaurant Daily Special cookbook! Thank you Kim! It is always a hit. Oh…my…yum! This recipe sounds great!